I am in the market for a portable hard drive, and considering a solid state drive (SSD). What are the benefits of an SSD over regular portable external drives, and are there any specific SSD models you can recommend? Should You Buy a Portable SSD? The obvious advantages of a solid-state drive (SSD) are speed and durability. SSDs store data in nonvolatile flash memory, which provides nearly immediate access to files on the drive. And there are no shock-sensitive moving parts such as spinning magnetic disks or careening read-write heads. Therefore, SSDs are inherently more rugged than their magnetic counterparts. Many laptops use internal SSDs because of the small form factor. But a new breed of portable solid state drives are arriving on the market, which have been engineered to extremes of ruggedness. So who wouldn't want a portable SSD? The answer is: many people who get a glimpse of the eye-watering price tags that portable SSDs carry. But for some people, portable SSDs make good business sense. Here are three portable SSDs to consider, each with its own unique features. The ioSafe Rugged Portable SSD may be the only thing beside a cockroach able to survive worldwide nuclear war. This 120 GB solid state drive ($499) can survive a 20-foot fall; 5,000 pounds of crushing pressure; and immersion in up to 10 feet of water for 72 hours. PC Magazine was curious to see if one of these babies would work while frozen in a solid block of ice; and it did! In the unlikely event that you manage to damage this drive, it comes with a year's worth of data recovery service insurance. So if you plan to store your videos of that Mount Everest climb on a portable SSD, the ioSafe Rugged is just what you need. ioSafe offers both aluminum and titanium enclosures, and bills the product as "an aircraft black box for mobile data." With a list price of $1499, the titanium model may cost about the same. Actually, loss or theft is a greater risk to portable SSDs than the possibility of getting stuck under an iceberg. 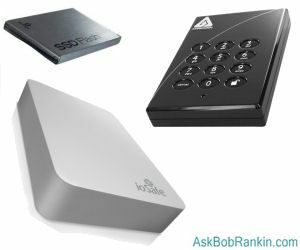 If your portable solid state drive goes astray with gigabytes of sensitive data, you'll be glad if it has built-in hardware encryption. That's the major selling point of the Apricorn Aegis Padlock Pro SSD, whose 256 GB capacity is protected by 256-bit AES encryption. A 12-key number pad on the front of the drive is used to enter a PIN that unlocks the encrypted drive. The Padlock Pro SSD is compatible with Windows, Mac or Linux, and offers Ultra-fast eSATA and USB interfaces with data transfer rates up to 219 MB/sec. The 256 GB model lists for a whopping $759, or $2.96 per gigabyte. Apricorn's spinning-disk equivalents cost about 30 cents per gig. The Iomega External SSD Flash Drive with USB 3.0 comes in three capacities and list price points: 64 GB for $229; 128 GB for $399; and 256 GB for $749. It comes with the Iomega Protection Suite of software. The vClone app makes an exact copy of your computer's system drive that you can carry across town and plug into another computer. Boot from the clone SSD and it's as if you'd never left your desk. A one year subscription to Trend Micro Internet Security for the PC or Trend Micro Smart Surfing for the Mac is also included, along with backup software and a trial version of Mozy online backup service. Both internal and portable solid state drives are gradually coming down in price. Given their speed and durability advantages over traditional electromechanical spinning disk drives, it's possible that SSDs will expand their market share dramatically in the near future. Most recent comments on "Portable Solid State Hard Drives"
Let me see.....I can buy a new hard drive, or a new computer for approximately the same price. Decisions, decisions! Do SSD's have the same concern with flash memory that thumb drives have? I.e., I don't trust just a thumb drive for writing and rewriting important data because I've been told it eventually wears out faster than the old magnetic type spinning hard drives. I have a 16 gig in my pocket now. I'm being facetious, but really 16 gigs is enough to store all your real personal data (photos and video excluded). Just got this flashvoyager from newegg for $8 after $10 rebate. It's water resistant, but the design has gone through the wash and survived fine for multiple customers. Doesn't have encryption, but I imagine it could if I cared to do so. I made the mistake when VCR's first came out with Electronic tuners and purchased one of the first ones out at the price of $1500.00. It was an RCA with a wired remote. So that said I learned my lesson about being able to be among the first to adopt. I will wait until we have a significant price drop. I can buy a lot of mechanical drives at the price of SSDs. With a tb at 80 bucks and 3tb at 160 i see NO reason for an ssd external. EDITOR'S NOTE: You're mixing apples and oranges. The advantages of SSD are speed and durability. The latter is all the more important for external drives that need to be portable. Granted, an external drive need not be solid state, but if you're willing to negotiate on price/performance, or place a high premium on ruggedness, you have a choice. I understand that SSDs do not have infinite number of read and writes? EDITOR'S NOTE: True, but no drive will last forever. That's why there is a MTBF rating (mean time before failure) for hard drives. As I understand it, recent advances in solid state drive technology have made this "wearing out" problem less of a concern. I second Daniel's question: How many writes can a memory location take before it wears out? Somewhat off the subject: When the iPhone came out, I decided to wait for the second generation, but got too busy when it came out, and as the months passed, I figured might as well wait for the 3, then the same thing happened with the 4, all the while my phone company's "mileage" points were adding up as I kept m,y old fogy phone by now 3 to 4 years old. Then I made a firm commitment to get the 5 and when the 4S came out, I decided to say "what the hell" and ask how much it would cost me. Let me get this straight - I can buy a 64GB Class 10 SDXC card for $120-200 or a 120+GB SSD in a metal case for $500? Why don't they just build a board into which you can mount SD cards and an IC to handle multiple I/O types (USB 3.0 / Firewire / RJ-45 and Thunderbolt)? Then it would be both versatile and upgradeable (by installing larger cards). Wrap it in a metal case with some internal shock mounting. Well, there may be enough early adopters to bring the price down in a year or two and we'll be able to get something with 4-8TB for a reasonable sum.